The antibody is conjugated with Peridinin-chlorophyll-protein complex (PerCP) under optimum conditions. 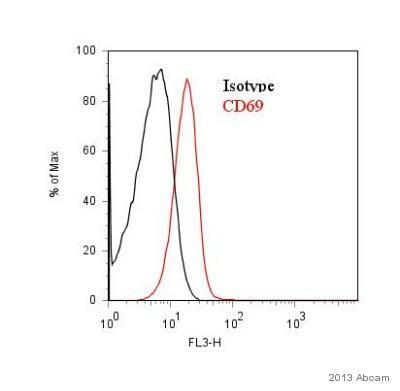 The ab135933 conjugate is made from a highly purified antibody (>95% by SDS-PAGE). Our Abpromise guarantee covers the use of ab135933 in the following tested applications. (In 100 µl of whole blood). 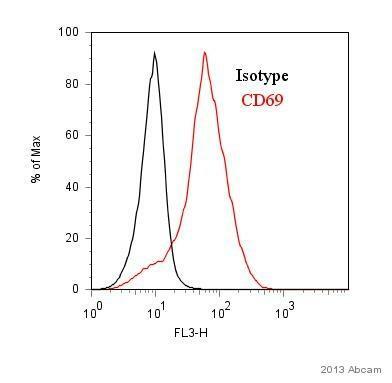 Flow cytometry analysis of Human whole blood from buffy coat, staining CD69 with ab135933. Cells were stimulated with anti-CD3/CD28 overnight before isolation by a Ficoll density gradient. The sample was incubated with the primary antibody (1/100 in 1% BSA in PBS) for 1 hour at 4°C. 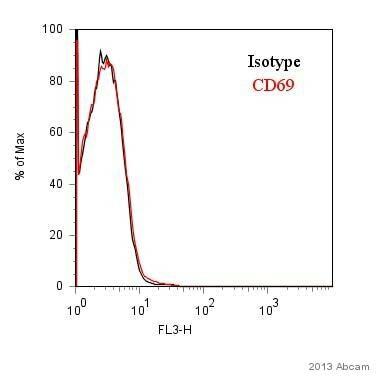 Flow cytometry analysis of Cynomolgus monkey whole blood after red blod cell lysis, staining CD69 with ab135933. Cells were stimulated with PMA overnight and fixed with paraformaldehyde. 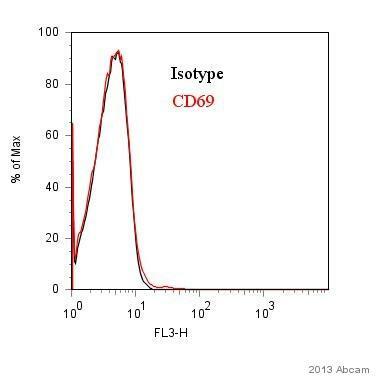 The sample was incubated with the primary antibody (1/100 in 1% BSA in PBS) for 1 hour at 4°C.